Jalapeno poppers of all kinds are delicious, but the ones with shrimp are among our favorites. Make these bacon wrapped shrimp jalapenos in the oven for a perfect party or game watching snack. These stuffed jalapenos have just the right amount of spice. You can control it somewhat by how well you clean them out. Then stuff them with melty cream cheese and shrimp and wrap them in bacon for a wonderful appetizer. This version was cooked in the oven, but we also love them done on the grill. They are perfect for parties, BBQs and to munch on while watching the football game. They never last long at our house! I have told you before of our family's obsession with poppers. During this time of year, stuffed jalapenos of one form or another make an appearance at almost every weekend's family dinner. It's kind of a running joke. Pops makes peppers stuffed with different fillings. He usually uses mostly cheese, sometimes bacon and he's even stuffed them with taco meat before too. We all go to town, then Pops' eyes start watering. He claims he "got the hot one." Every week. Some how he always ends up with the hot one of the group. He has the WORST luck (or lowest tolerance, it's a weekly debate) of all of us. 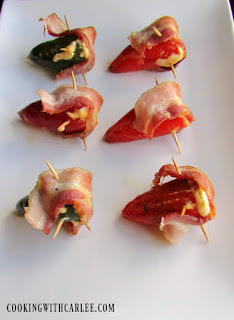 We love stuffed jalapenos on the grill, on the smoker, in the oven, with meat or without. We love them all. Then K.C. went and introduced us to a game changer. On the day of our now infamous Great Poultry Grill-Off, he brought a surprise addition to put on the smoker. 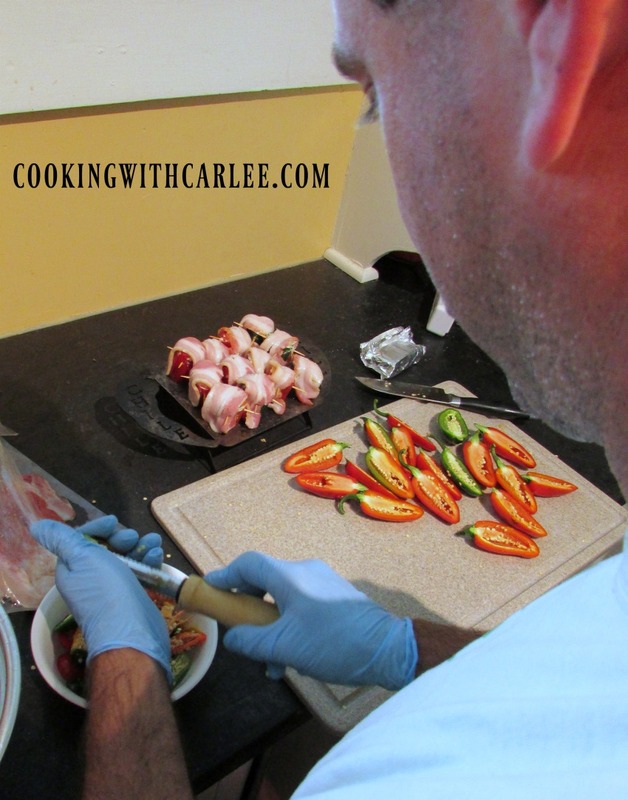 Shrimp stuffed, bacon wrapped, cream cheese filled poppers became an instant hit! The platter disappeared as quickly as he put it down. I just knew that wouldn't be the last time we had such a delicacy. I had to have them again. Luckily our jalapeno plant is loaded with peppers and they are super spicy this year! Matt volunteered to help make them and I knew better than to turn down an extra set of hands. The only problem was we had different visions in mind. He thought we were going to stuff whole peppers and roast them upright in our jalapeno roaster. I thought we'd cut them in half lengthwise like K.C. had and roast them on their side. It turned out we had more then enough supplies to do them both ways and they were all delicious! We ended up making 40 poppers. 12 were whole pepper poppers and 14 more peppers cut in half. They were all gone within and hour and it was just us, Pops and my brothers (all three of them) to help eat them. So 6 of us demolished them! They were that good! If you are cutting the poppers in half: cut them lengthwise and remove the seeds. Mix together the cream cheese and garlic powder and press some cream cheese mixture into each jalapeno. Lay a shrimp down the center of the jalapeno. Wrap with a half slice of bacon and secure with toothpicks. If you are leaving them whole and cooking them upright: Cut the stem off of the jalapenos and clean the seeds out of the middle. Chop the shrimp and mix with cream cheese and garlic powder. Stuff into jalapenos. Cross 1/4 slices of bacon over the top of the pepper and secure with toothpicks. Place in rack to cook. Normally we grill the peppers, just grill covered over medium heat. By the time the bacon is done, everything is done. This time I did them in the oven. I baked them at 350 F for 10 minutes and then turned it up to 400 for 5-10 minutes or until the bacon is done to your liking. Allow to cool for a few minutes before serving. Pops wants it known that he definitely DOES get the hottest pepper each week. It's not even bad luck. He knows how to pick them and just wants to be a good protector for his children. Either way- thanks go to KC for coming up with the original game changing poppers and to you and Matt for so generously keeping it going. Pops can tell the story however he wants ;-) These are definitely winners! Be Still My Heart! These little Poppers sound Absolutely Amazing!!!! Love that you put shrimp in there! I can hardly wait to try them. You are going to love them! The shrimp goes perfectly with the spicy pepper and bacon. Thank you! Holy cow do these look yummy, I'll bet they are so full of flavor! And you know what I'm thinking, college football kick off is this weekend so I think the Mr. and I are going to need a huge plate of these! They are so good! We like them without shrimp too, but the shrimp really adds that little something that takes them to the next level! I hope you and Mr. Nine love them! I love your husbands idea of having them upright, clever! Now, I just need to get my husband on board and find a way for him to love jalapenos! He bought me that jalapeno rack when we were visiting Texas right after we got engaged. We had never seen anything like it. Now it is easy to find similar items. It is fun to cook them upright, but he likes to leave a "present" of some extra seeds and membranes when he makes them. So you have to keep an eye on him! I love the idea of putting shrimp in these! You absolutely have to try them with the shrimp!! Oh Carlee, I just picked up jalapenos this am for my crab stuffed jalapenos!! They're super hot and I'm not even sure we'll be able to eat them, lol!! I think I have to use a little shrimp, too, now! These look excellent!! Oooh, yum! I hope you post your crab ones! Hopefully the cream cheese and heat take some of the spice out for you! The shrimp are sooooo good in there! My brother made another batch of these this weekend and the disappeared! 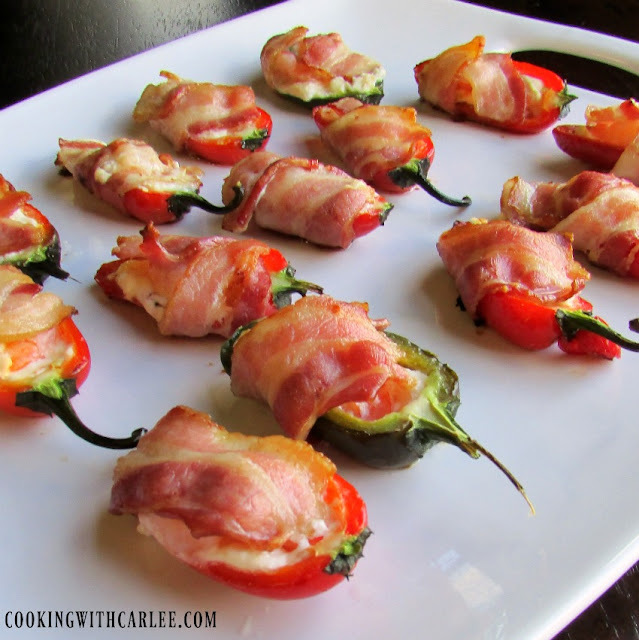 Those poppers look and sound like the perfect appetizer Carlee! Thanks for sharing this recipe at Cooking and Crafting with J&J. Thanks, Julie! They are definitely a new family favorite! The shrimp is soooo good in there! You have to give it a try! Thanks, Jessica. Yum these look delicious - I love the heat from the jalapenos!